Here�s a little story you may (or may not) find interesting. About 7-8 years ago I was working in <? :namespace prefix = st1 ns = "urn:schemas-microsoft-com:office:smarttags" />Camden Town, right next to the canal. And some lunchtimes I would have a stroll along the canal towpath that went past London Zoo. On this particular day the temp was about 23-24oC and some of the footpath was being replaced. As my friend and I strolled along, I suddenly noticed a snake head appear from under a cracked slab. 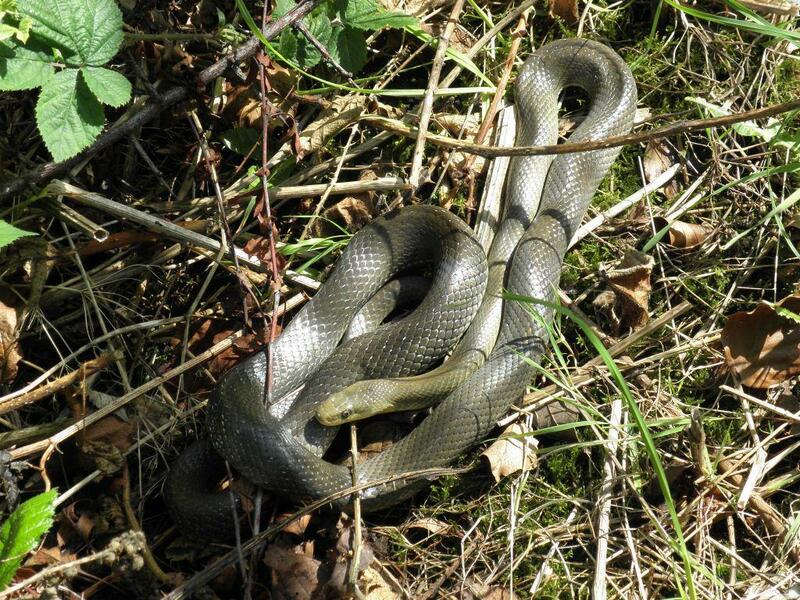 I didn�t immediately recognise the species other than it wasn�t a grass snake or adder. I picked it up and it was at about a metre long. I took it along to the study/teaching centre that was on that side of the canal (opposite side to ZSL), thinking maybe one of their charges might have escaped. The man who answered the door protested that they hadn�t lost anything and that there were snakes all along the canal bank and they lived in the burrows and ate the rats and said I should let it go. Okay if he was sure. And down a hole it went. Now, I have just come across a picture that reminded me of that snake. It was a bit more grey but I think it was an Aesculapian Snake. What do you think guys an gals? Are they living and breeding on the Regents Canal? I wonder if they originated from 'Palmers Pets' that used to be in Parkway. I remember going in there as a kid, on my way to London Zoo, and seeing exotic pets like cotton eared marmosets. Am I right in thinking the other population is also next to a Zoo. Coincidence? Funny you know, I've always been surprised that garter snakes have not established themselves in UK. I remember hundreds in pet shops in the late seventies and some must've escaped or been released. They seem very similar to natrix in their habits (Apart from the fact they give birth to live young). I have read this several times and still cant make sense of it, this will probably irritate some people. 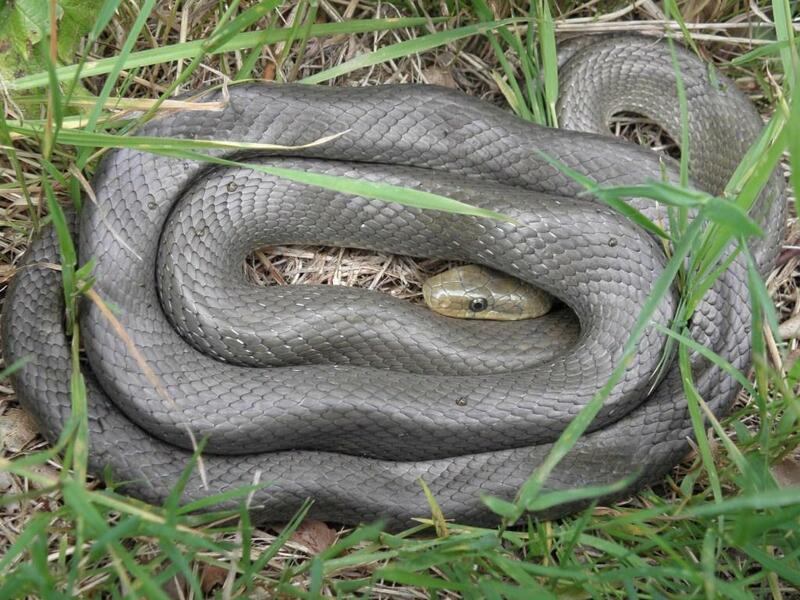 But are there two colonies of Elaphe Longissima in the UK? One in Wales one in London? The only thing I can think of is, perhaps those garters need a harsher winter in order to procreate? Or maybe the extremely high population found in hibernacula may have something to do with survival. Tony, a dead BC must've been a sight! The only foriegn species i've ever found was natrix tesselata along the motorway embankment at Shepperton middx and european pond turtle also found in Shepperton swimming in the gravel pits. No that round encloser (snake pit) is long gone. No wonder I could never see anything in that pit. You'd nicked the lot! Kids eh! That Post Tickled me Keith, but you're not the only one. When I was 13 I reguarly visited a pet shop not too far from where I lived. This particular pet shop was very long and narrow with four rooms , the till being in the first and reptiles in the third. One very hot day the owner had left a side door open in the reptile room and he was serving out front. I couldn't resist , I put my bicycle clip round the bottom of my jeans opened my flies and put a baby burmese python inside shaking it down my trouser leg. Then out the door and peddled like mad home with a big grin on my face. "No, I don't believe it, you've had a python nicked Frank?" "Snakes Alive! 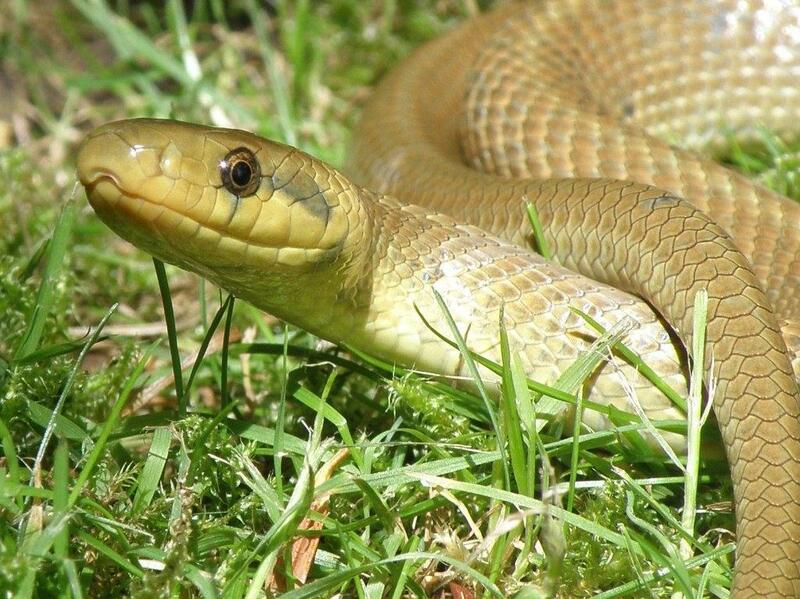 Python Stolen From Local Pet Shop"
Back to the garter snakes - wasnt there a few hundred released from the studios who filmed Indiana Jones and the Raiders of the Lost Ark? R.e Aesculapians, All very interesting. I used to live and work around Regents Park but never realised that this species resided on my doorstep. Wonder what the population density is like given that they've been there some years? There was some work being done on a footpath coming down from the main road, when I found my one. I noticed a snakes head peering out from the edge of the unfinished path (paving slabs) and pointed it out to my mate Ron, who proceeded to walk in reverse. As the snake came a little further out I grabbed it and extracted it from its hole. I took it to the study facility ZSL has on that side of the canal. I asked if they had lost a snake.The guy who answered the door, took a step back and exclaimed 'they're all along here. They feed on the rats and rabbits'. If they have been doing that for 20 years and they're all along the canal embankment, could there be a fairly healthy population. Sounds like another RAUK Day trip is taking shape. Anyone for next Saturday? 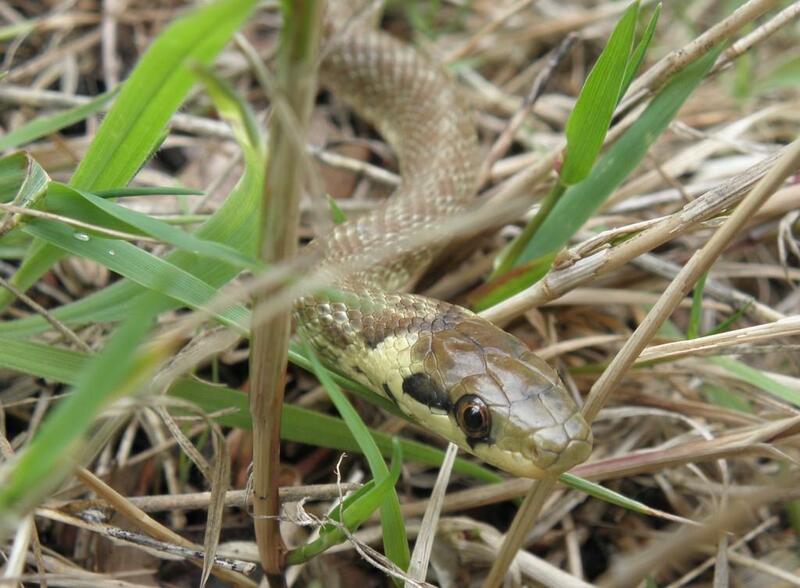 Been looking at the snakes over the summer - am hoping to help ZSL with some form of survey work to establish how many / where the snakes are - they're close to various bird enclosures, for example. 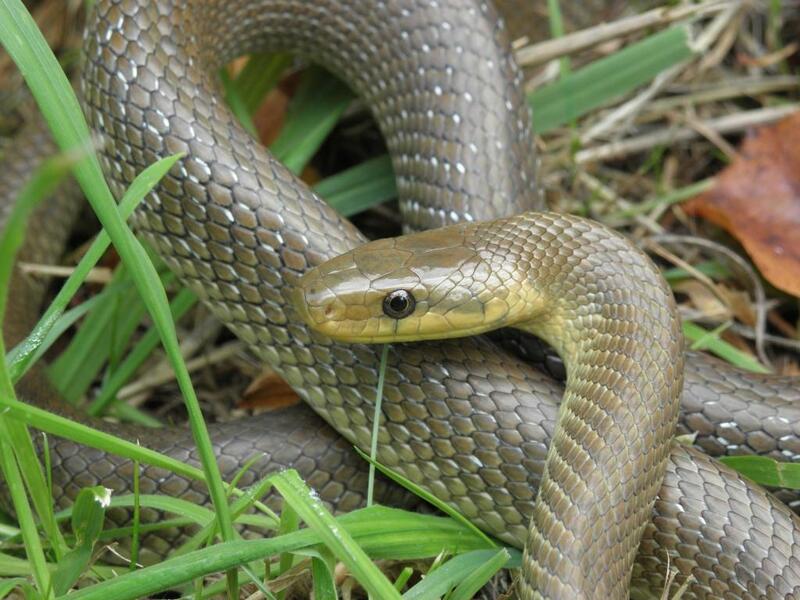 Great animals though - I have spent time in France, Spain, Italy etc looking for Aesculapian snakes - ironic that my first wild (OK, feral) ones should be a couple of miles from my work..
Hopefully the fully fledged ARG will form this year ready for next year's survey season. 1.5 Metres is a pretty decent size. One thing we noticed in the N. Wales population is that average size is very small compared with natural populations in Germany and Poland. Any hints on average sizes in London? The larger snake's size was estimated when I photographed it crossing a paving slab for scale. The smaller one was about 75cm but nothing to allow a more accurate guesstimate. Maybe ZSL have more extensive data which could produce a meaningful average ? Another snake from last weekend - basking at the base of a tree, measured approx 130cm when I put my camera case beside it. Made a couple of visits to the area over the past few weeks as well as earlier in the year but alas no sightings.Last visit 15/9/07 met two other very capable and experienced enthusiasts from south of the river with same quest.As i left before them can they contact me on PM of their results. When the weather warms up next year, who's up for a return visit? P.s, As i don't post much (at least at the moment anyway), I'd just like to wish all the RAUK forum members a very Happy New Year. Alex. I'm definitely up for a return visit and will be keeping an eye on the site throughout next year, I expect. I still have no idea of the population density In London. I was amazed to find a snake within the first 10 minutes on my first visit; however, the next couple of visits produced nothing, so who knows? Anyways, I will certainly show you the site. I'd be happy to show people where I saw some last year, but a seasonal message from 'Elf 'n' Safety' regarding needles and trees - and I'm not talking the Xmas conifer variety. Anyone trying to spot Aesculapians on the banks of the Canal should be aware of a subspecies of human which also uses the banks for narcotics - dirty needles abound, sometimes thoughtfully stuck in trees but sometimes left on the ground - it's no place for a family trip (no pun intended) - it's safer to search within the zoo grounds ! PS I wonder when they emerge - any data from the Welsh Mountain Zoo pop ? I'd like to get back and have a look sometime. I'm guess they would emerge sooner than the WMZ population. London is always that bit warmer. Let's wait to hear from the experts. must admit i'm not that familiar with camden apart from the market and walk up where kings reptiles used to be but i would def be up for going for a look when it's warmer. I'm very interested in going if others are - grateful for a PM ahead of any planned trips. Anyone know when they are likely to emerge? Too hot for natives so I went for a walk along the Regent's Canal in London, and found the first feral Aesculapian snake which I saw three years ago; confirmed by examination of scalation. I've not seen one before early May before now, but as it was 21degC it was certainly warm enough. 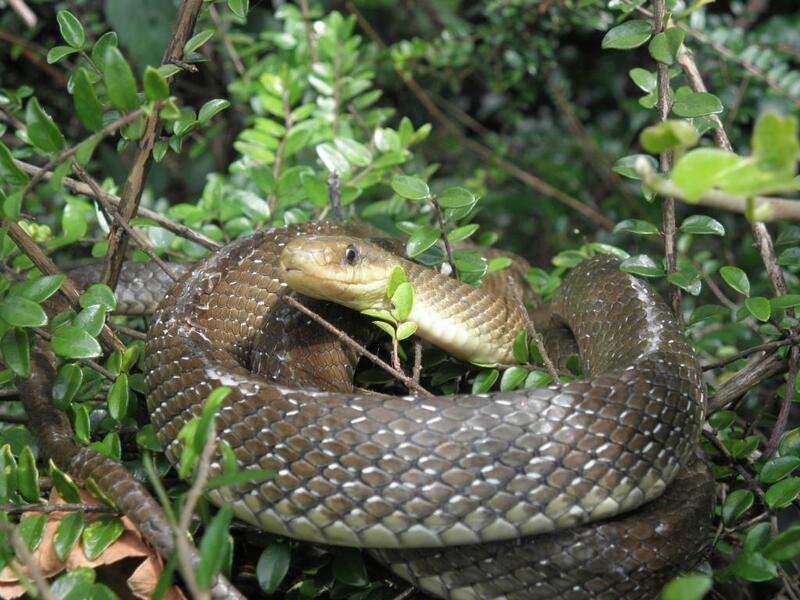 (You can see a photo of the same snake earlier in this thread). This one from today, around 200m from the zoo, and last seen in the zoo grounds in May 2008; they certainly seem to move reasonable distances along the canal. A bulge in the middle indicated a recent rodent meal. alien species in the UK. Same one again today - huddled up under a cloudy sky and about 50m from where it was a couple of weeks ago. Mouse bulge now gone. authorities might be thinking of removing them. In my view this population is probably doomed to extinction; it occupies a relatively small part of the Regent's Canal, and probably numbers no more than a few dozen (max) adults (I've found 17 different animals over the last three years). Egg laying sites are probably a limiting factor, and I imagine that ZSL / London Zoo isn't too keen on them (more because Joe Public is likely to think that if Aesculapian snakes can 'escape' from the Zoo then so could Black Mambas etc, although I've heard it alleged that these snakes were deliberately released rather than escaped). 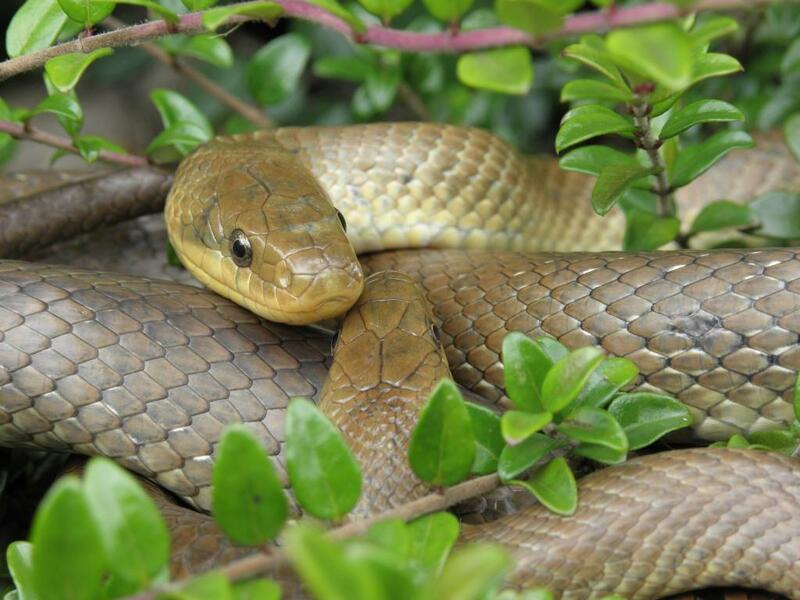 If you go to www.islingtontribune.com and put the word 'snake' in the search facility you can see a reasonably balanced article on the Camden Aesculapian snakes (apart from the headline, which I guess is designed to lure the reader into reading on!) I hope the snakes remain unmolested - fortunately they'll be underground in a few weeks' time..
underground in a few weeks' time..
Nice to hear they're still around Will. Also nice to see a balanced paper article, compared to the normally biased rubbish. I'm thinking about taking a trip up to London in the next couple of months to look for them and would appreciate any pointers on how to find them. I was interested to find the same individual as the one pictured above today, but in the zoo grounds and at least 200m from where he was a couple of weeks ago. Looks like s/he's also up for a shed, judging from the eye. Tired to send you a PM Will, but your inbox appears to be full. I'm off to London next Tuesday so hopefully the weather will play ball. judging by your highly enthusiastic and repetitious (no offence intended - great to see!) postings/pix of this alien Will, do i correctly interpret that you hope this species will survive and thrive in the UK -despite your aforementioned odds against establishment? Keep up the reports Will I find them fascinating. I think very much a special case as there is no real threat of this species extending it's current range in the UK or any obvious threat to native species. As far as I know this wasn't an intentional introduction, rather a single escapee, amazing that an apparently healthy population exists. Thanks Gemma; I couldn't agree more. I think there may have been several original escapees, rather than the single gravid female which started the WMZ population, so perhaps the Camden ones have slightly less chance of inbreeding effects (but then again, I'm amazed that the WMZ population is still thriving given that they're presumably all as closely related as you can get). It would be interesting to do a genetic analysis of the Camden animals, but of course this would require a special licence etc. 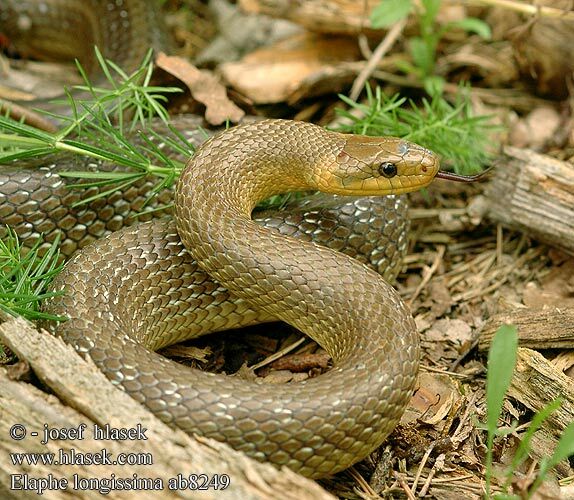 One other point about them which I find interesting from an ecological point of view is that they occupy such a different niche from our native snakes (and most other snakes in Europe), occupying quite shaded woodland. In France for example, where they are native, this lack of competition with other snake species has been documented by various authors. 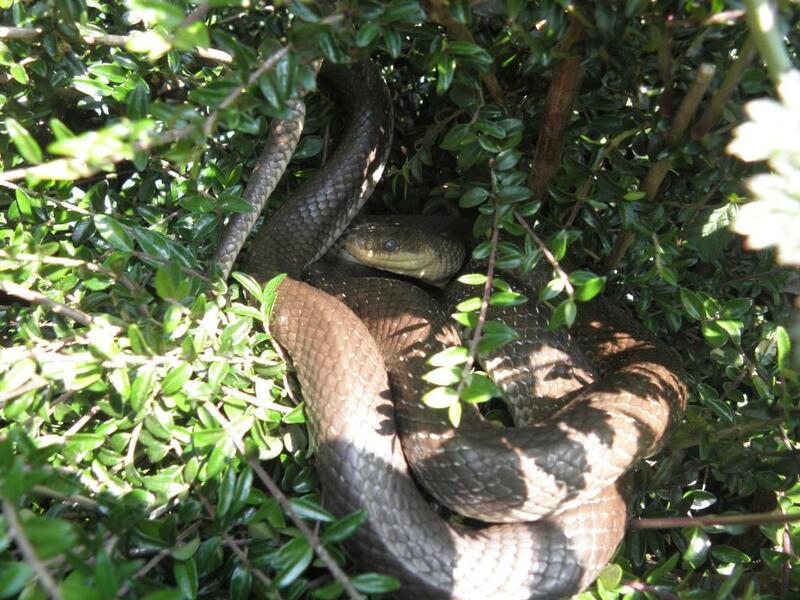 It makes a change to find a snake 2m up a tree ! Cheers for the reply to the e-mail Will. I'll be spending a hour or 2 looking for them on Tuesday if the weather plays ball(at the moment it looks iffy). message for Wolfgang - you seem to be over the limit on pm's - can you email me at the Trust email - mailto:lehartrust@hotmail.com - lehartrust@hotmail.com and I'll get back to you ASAP please? managed to get an hour at lunch along the Canal, and saw a equal-top number of four snakes, including 3 which were new to me (ie not recorded before) giving a total of 23 animals to date, since July 2007. This one was basking in a fairly exposed location with a big mammal bulge inside. I guess after the horrible weather of the last week, these Italian immigrants were grateful for some warmth at last! thanks will yet another dazzler. i wouldnt mind a look at these myself but must admit Colwyn seems more inviting than London - im bigcityphobic. be interested to see a London habitat pic or two though. have you got any? wow! great stuff will. you must be chuffed. if they've managed to successfully breed over the last few cool wet summers then maybe they will survive for a few more generations. Good stuff Will, must take a look up there again somewhen and see if I can see any more. Did you find the one I saw and told you about? Thanks Guys; Tim, I am chuffed - though I've yet to see any interesting behaviour from these enigmatic animals, including any hanky-panky, but I guess it must happen fairly often and the eggs must incubate successfully, as the hatchling shows, even in wet and cold summers as you point out. 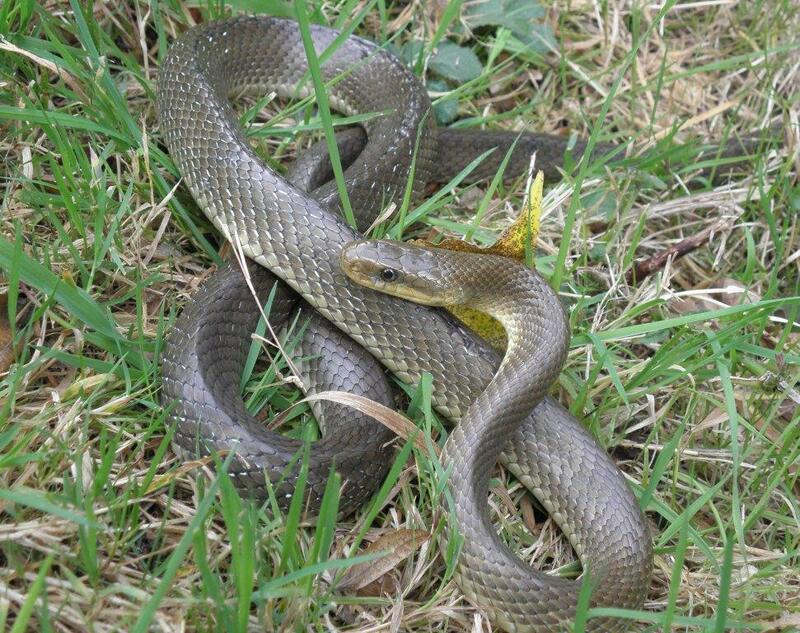 Sorry Mark, I thought I'd emailed you about the big one you saw - yes, I saw it too - it was snake number 1 - ie the very first one I saw in 2007, still going strong. I also saw one today of equal size, c 1.4m, which I hadn't seen since 2008. Any ideas on where they may be laying Will? I read that they require artificial heat sources to incubate their eggs, much the same way as Natrix and the key reason why they can sustain populations in our climate. I'd love to have a look next time i visit my London inlaws. It might help to take my mind off the hectic city bustle.....and the inlaws! If so could i PM you and get some hotspots? Beautiful pictures, are the pair on top of an ornamental hedge? great pic of the two together Will.Fab. Thanks Dave; never found two actually intertwined before - tempting to think they could be male and female, but aside from one being bigger than the other and possibly with a broader head, I couldn't tell. Drop us a PM Scale, when you're likely to be around and I'll give you some pointers or possibly meet up. Reckon eggs are laid in leaf mould along the banks, several of which are in the Zoo grounds, but I've never found any shells to confirm this. No plans to go as yet, but will let you know. well, from the high of spotting a hatchling last week to the low today - snake number 1 horribly injured by a strimmer (my guess) causing a deep wound along much of the spine - one of the dangers of living in proximity to humans. At least it seemed to be healing over, and the snake seemed fully mobile (so no spinal damage, I think) - they're resiliant animals, for sure. I've actually found more on the south bank, which is north facing - exactly the opposite of what you'd expect from a reptile. I have no idea why, although for a partly arboreal species maybe the aspect of a bank is less important than for a totally ground dwelling species. Could be more rats on the zoo side, too, although there's plenty of them on the other bank too! Great to see they are still doing well. I'd have liked to have paid them another visit this year but that's looking very unlikely now. I'll be sure to have a go at getting some decent shots of them next year. forecast is good for next week 20 degrees plus they reckonbetter than the 13 degrees and pouring rain and hailstones I got at Colwyn Bay zoo last week ! Sound advice Dave - it was worth taking a look today in London; two snakes within a few minutes and a few metres of each other, possibly seeking the same part of the canal bank for hibernation. Strangely enough the snakes were the first one I ever saw (ie code number 1 - which has recovered quite well from the horrible wound sustained from a strimmer or somesuch a couple of months ago), and a brand new snake, code 29. So I guess they sort of 'bookend' the individuals which I've seen over the past four years. Could be a few more decent days, if the mini-heatwave forecast keeps up. Nice one Will,I m always happy to give advice on snakes that I have never seen ;) .Thanks for the pics though always find them facinating and great you got both ends of the scales ,so to speak. Surely more appropriate to reduce the population to their Category 5 - 'species for which insufficient data or evidence was available from those present to be able to prioritise' (which includes European pond terrapin, for example)? If it's recommended to remove London's snakes, then presumably the same must apply to those at the Welsh Mountain Zoo, too? 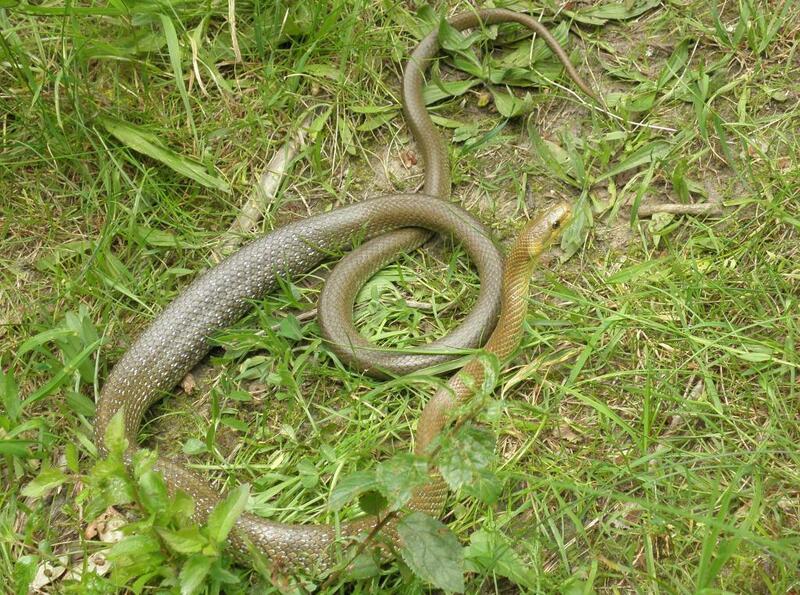 Hopefully far more research would be done before any action was taken against these two Aesculapian snake populations. It would be great if those concerned with putting this list together actually consulted with people that have real knowledge on the subject and listened to their views and opinions before making any hasty decisions and taking any unnecessary action. 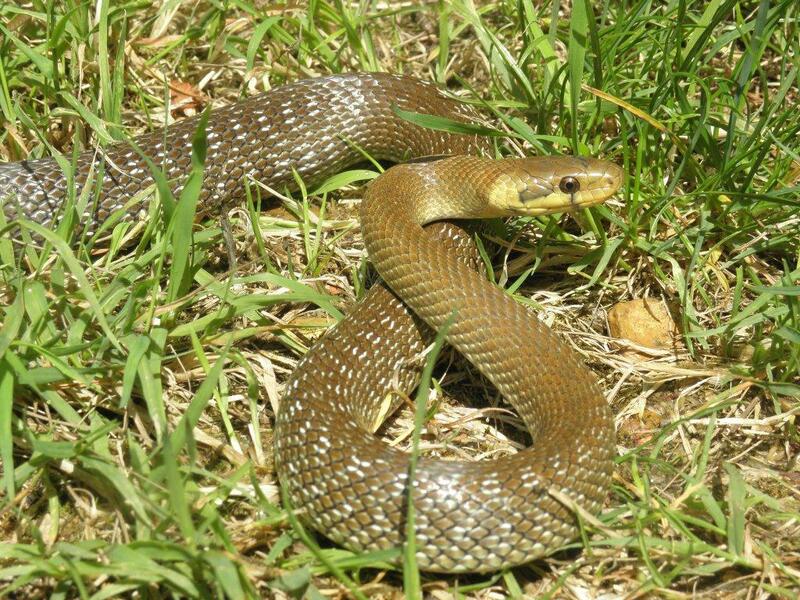 What we have here is a species of reptile which is miles from any native reptile population, and which utlises a different niche from our natives in any case, and which feeds almost exclusively on rats and mice. Seems totally potty to me, we have cases of purposely introduced reptile species that most likely would impact on very rare native species in terms of competition for habitat. Yet even then my view is there would need to be research to determine any actual impact before taking action. Perhaps Will something LEHART can address? Surely a case where common sense will prevail and these fascinating creatures will be left to get on with life? Hi Gemma - I'm doing my best to ascertain why they've been put on the list and who suggested their prioritising for eradication. I'm not sure I can do it under the banner of LEHART, since our Trust's objectives are specifically 'the conservation of native amphibians and reptiles in the three counties of London Essex and Herts' (and even I can't argue that they're native!) But rest assured I'll do what I can, and if it comes to it, perhaps we/ARG UK etc can register disapproval? Even if there we did have these "dangerous snakes" along the canal banks as the sign suggests, the risk of being bitten by one would still pale into insignificance in comparison to the risk of being mugged or beaten-up along those canal banks at night or the risk of drowning in the canal itself! Thanks Tim. 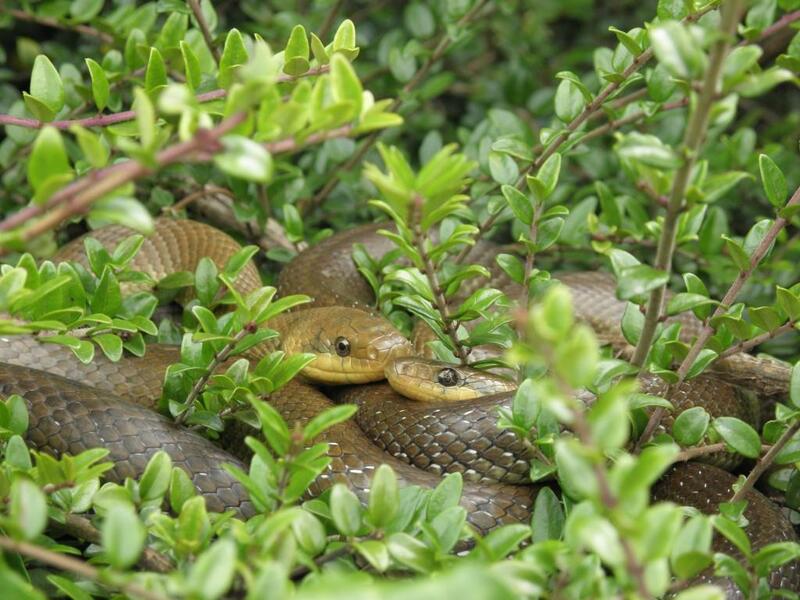 I always wanted to put up some of those 'lost pet' notices on trees etc saying something like 'Lost, anaconda - answers to the name of Annie, very friendly, cuddly snake, approx 30ft long. Any information to ...' etc - this notice reminds me of that. Went briefly to the Zoo for a meeting and just had time to spot my first snakes of the year, about 7 weeks later than last year (April was a complete write-off, of course). 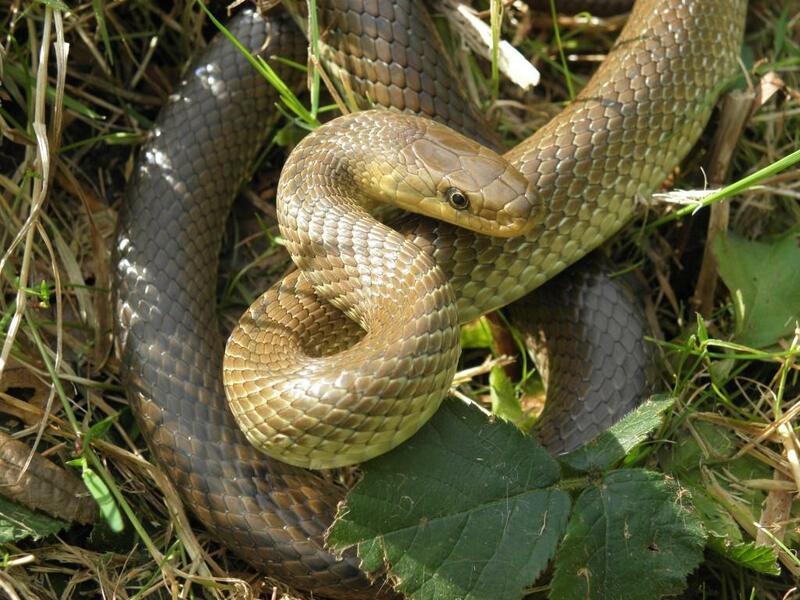 To be precise, I managed to see enough of the snake below to ID it as none other than 'snake 1' - the strimmer wound healing nicely and somewhat to my surprise, it managed to survive the winter and appeared in good condition - great survivor, number 1. Below that is an individual some distance away with a large prey bulge (small rat, I think) enjoying the hazy sun. I visited the site with two other guys last week (David Jones & Kevin Parr) and bumped into another guy who was also looking for the snakes. His name was John Robertson and apparently he'd already spoken to you. 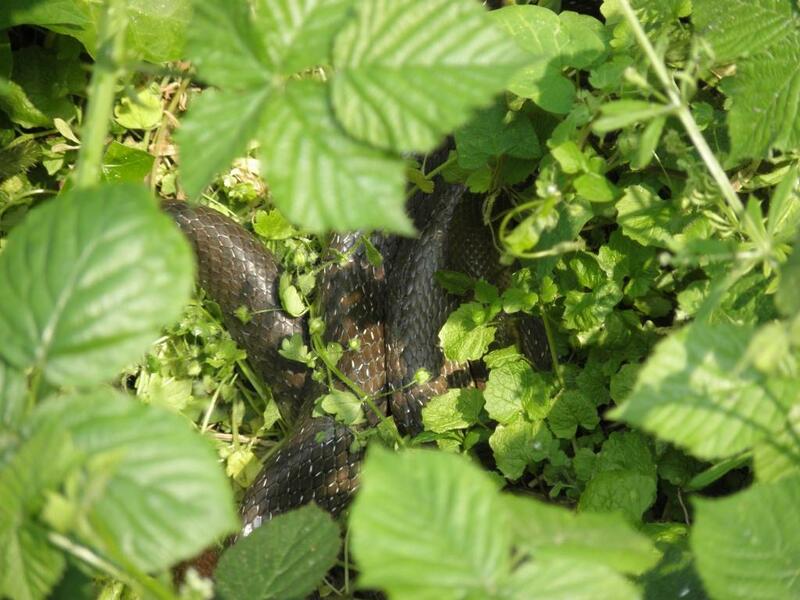 Anyway we teamed up together and managed to find a beautiful snake basking by the side of the canal. A very calm specimen happy to pose for a few photos. I'm sure you'll be able to identify this one.